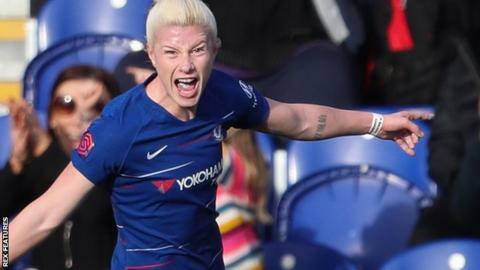 Chelsea and West Ham shared the points in a tense London derby in the Women's Super League. The hosts opened the scoring three minutes before half-time when Beth England headed in Erin Cuthbert's free-kick. But West Ham equalised with a header from ex-Blues defender Gilly Flaherty. England nearly scored the winner with 10 minutes remaining but her lob over West Ham keeper Anna Moorhouse narrowly cleared the crossbar. Playing in their first fixture since their 3-2 aggregate win over PSG in the quarter-finals of the Champions League, Chelsea had dominated early on as England nearly opened the scoring sooner, seeing her shot diverted onto the post by Moorhouse. But once the Hammers went behind, Matt Beard's side rallied and they avoided a second straight league loss. The draw for Chelsea - coupled with rivals Arsenal and Manchester City's wins - confirmed that Emma Hayes' side will need to win this season's Champions League title if they are to qualify to play in Europe next term. The Blues, who face French holders Lyon in the European semi-finals in April, can no longer finish in the top two in the league this season. Match ends, Chelsea FC Women 1, West Ham United Women FC 1. Second Half ends, Chelsea FC Women 1, West Ham United Women FC 1. Attempt missed. Erin Cuthbert (Chelsea FC Women) header from the left side of the six yard box is close, but misses to the left. Attempt saved. Adelina Engman (Chelsea FC Women) header from very close range is saved in the bottom left corner. Assisted by Karen Carney with a cross. Attempt blocked. Erin Cuthbert (Chelsea FC Women) header from the centre of the box is blocked. Assisted by Karen Carney with a cross. Corner, Chelsea FC Women. Conceded by Kate Longhurst. Attempt blocked. Ramona Bachmann (Chelsea FC Women) right footed shot from outside the box is blocked. Assisted by Adelina Engman. Attempt saved. Hannah Blundell (Chelsea FC Women) left footed shot from outside the box is saved in the bottom right corner. Assisted by Ramona Bachmann. Foul by Ali Riley (Chelsea FC Women). Brianna Visalli (West Ham United Women FC) wins a free kick in the defensive half. Attempt saved. Erin Cuthbert (Chelsea FC Women) right footed shot from outside the box is saved in the top centre of the goal. Attempt missed. Ramona Bachmann (Chelsea FC Women) right footed shot from outside the box is high and wide to the right. Assisted by Karen Carney. Foul by Adelina Engman (Chelsea FC Women). Ria Percival (West Ham United Women FC) wins a free kick in the defensive half. Attempt missed. Beth England (Chelsea FC Women) right footed shot from the centre of the box is too high. Assisted by Karen Carney. Attempt missed. Maren Mjelde (Chelsea FC Women) right footed shot from outside the box misses to the right. Assisted by Ramona Bachmann. Substitution, West Ham United Women FC. Rosie Kmita replaces Leanne Kiernan. Corner, Chelsea FC Women. Conceded by Gilly Flaherty. Corner, Chelsea FC Women. Conceded by Anna Moorhouse. Attempt missed. Magdalena Eriksson (Chelsea FC Women) header from the centre of the box misses to the right. Assisted by Karen Carney following a set piece situation. Ali Riley (Chelsea FC Women) wins a free kick on the left wing. Foul by Alisha Lehmann (West Ham United Women FC). Substitution, Chelsea FC Women. Hannah Blundell replaces Jessica Carter. Substitution, Chelsea FC Women. Karen Carney replaces Drew Spence. Attempt missed. Millie Bright (Chelsea FC Women) right footed shot from more than 35 yards is high and wide to the right. Goal! Chelsea FC Women 1, West Ham United Women FC 1. Gilly Flaherty (West Ham United Women FC) header from very close range to the bottom right corner. Assisted by Leanne Kiernan with a cross following a corner. Corner, West Ham United Women FC. Conceded by Carly Telford. Attempt saved. Jane Ross (West Ham United Women FC) left footed shot from the right side of the box is saved in the top right corner. Attempt blocked. Jane Ross (West Ham United Women FC) left footed shot from the right side of the box is blocked. Assisted by Alisha Lehmann. Millie Bright (Chelsea FC Women) wins a free kick in the defensive half. Attempt saved. Beth England (Chelsea FC Women) right footed shot from the right side of the box is saved in the centre of the goal. Assisted by Ji So-Yun. Ji So-Yun (Chelsea FC Women) wins a free kick in the attacking half. Foul by Cho So-Hyun (West Ham United Women FC). Offside, Chelsea FC Women. Millie Bright tries a through ball, but Beth England is caught offside. Offside, West Ham United Women FC. Anna Moorhouse tries a through ball, but Jane Ross is caught offside. Attempt missed. Beth England (Chelsea FC Women) right footed shot from the centre of the box misses to the left. Magdalena Eriksson (Chelsea FC Women) wins a free kick in the defensive half.